The following is an extended version of a tribute that was first published in Art Monthly Australia, Issue 227, March 2010, pp.29-30. I last saw Shane Pickett in the week before his death. Ever an industrious artist, he was busy putting the final touches on a series of delicate figurative landscape paintings intended for a solo exhibition in Melbourne. 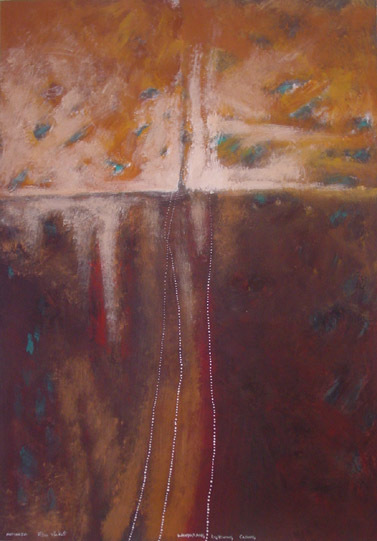 Spindly gum trees and gently undulating hills glowed with an outback haze against the white walls of his studio. In the past decade, Pickett had garnered widespread acclaim for his commanding abstract paintings, but few outside of Western Australia were aware that this was where his artistic journey first began. Flashing his famously impish smile, he quipped at the surprise that these works would elicit amidst the cosmopolitan Melbourne scene. It was a rare moment of retrospection from an artist whose career had been characterised by a restless forward trajectory of transformation and reinvention. After a career spanning three decades, Pickett had much to look back upon with pride. He had held at least 27 solo exhibitions and been involved in nearly 100 group shows. His works had travelled to America, Europe and Asia, and had been acquired by many of Australia’s most important collections, including the National Gallery of Australia, the National Gallery of Victoria and the Art Gallery of Western Australia. And yet, these were not the things that most interested Pickett. Although a proud man, he was never vainglorious and rarely spoke of his successes or achievements. When questioned, he preferred to speak on the cultural aspects of his art and career, measuring his journey not by accolades, but by his deepening knowledge of his Nyoongar heritage. For Pickett, art and life were united in an ever-expanding process of learning, in which spiritual and artistic developments were combined in a continually evolving process of creation. A metaphor for this process can be seen in Pickett’s many representations of the moment of creation. 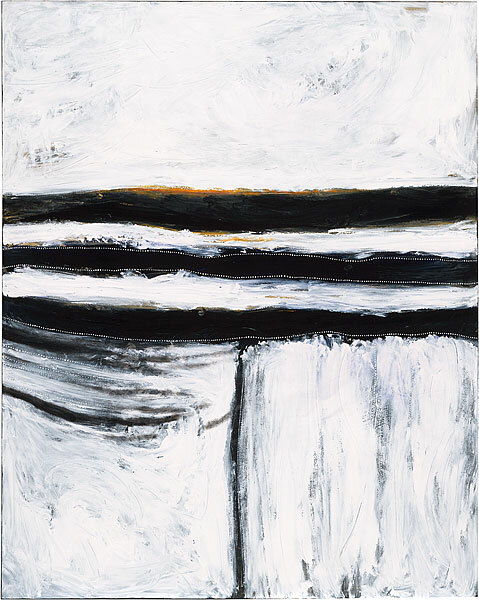 This was the theme of his first important abstract work – Supernova 1988 – and it culminated in one of his best known paintings On the Horizon of the Dreaming Boodja 2005 (National Gallery of Australia). 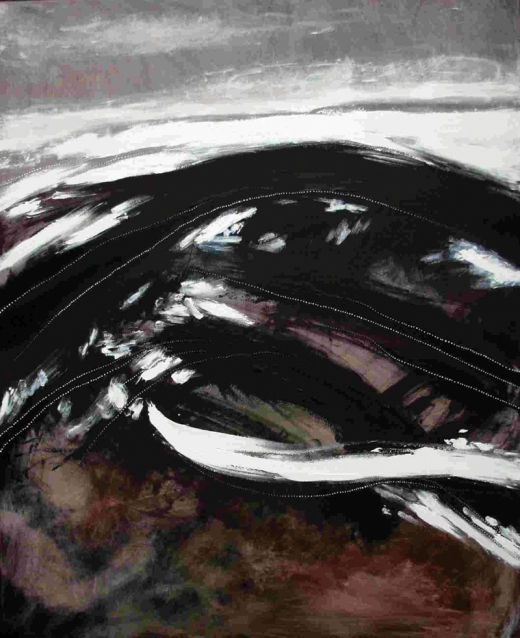 In the latter work [pictured above], delicate beams of light break through an abyss of white impasto, signifying “the birth of life, breaking through the warmth of eternity, bringing the beginning of the Dreaming Boodja, a place mankind calls earth.” In visualising this moment, when everything is born from the vacuum of nothingness, Pickett created a profound meditation on the nature of being. The viewer is held in suspense, literally stuck in the space between existence and non-existence, suspended forever on the horizon of being. Shane Pickett, Three Faces of the Sun 1986, Museum & Art Gallery of the Northern Territory. Pickett’s life and career presents a similar ontological conundrum. Like a supernova, he was an incredible creative source. Through his inspiration and influence he helped guide three decades of development and change in Indigenous art, culture and identity, particularly amongst the Nyoongar community of Western Australia. On the other hand, Pickett was very much a man of his time, with much of the resonance of his artwork and personal philosophy coming from their perfect articulation of the changing moods and attitudes of the world around him. The son of Fred and Dorcas May Pickett, Shane Pickett was born in 1957 in the wheat-belt town of Quairading, about 170 kilometres east of Perth. Surrounded by athletic siblings but suffering from rheumatoid arthritis, Pickett gravitated to art from an early age. In 1988 he recalled, “I can’t remember a time when I didn’t have a pencil or brush in my hand.” The Nyoongar people had a strong artistic lineage, springing from the figurative landscape style that emerged from the Carrolup River Native Settlement in the 1940s. It was a style that Pickett quickly mastered, taking the intense colours of the Carrolup school and matching it with a rugged lyricism. After completing high-school, he moved to Perth, where in 1976 he held his first solo exhibition at the New Era Aboriginal Centre. Much like the school of watercolour painting that evolved around Albert Namatjira and the Luthern Mission at Hermannsburg, the Carrolup style represented a very particular Indigenous response to colonialism. In an era in which assimilation remained official policy, these styles allowed a subtle communication of the significance of the Indigenous landscape, camouflaged within a palatably European medium. The spiritual and cultural underpinnings of these works remained largely unnoticed, and their subversion of Western perspective unrecognized. By the early 1980s, as issues such as land rights and Indigenous self-determination began to gain momentum Pickett, like many Indigenous people, had begun to seek a more assertive vision of Indigenous identity. 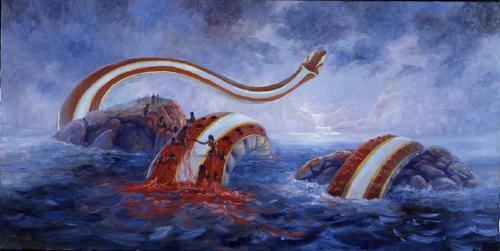 Taking the skills learnt as a landscape painter, he moved into the realm of magic realism. Again, a landmark work from the period concerned the moment of creation. Waagle – The Rainbow Serpent 1983 (Art Gallery of Western Australia), was a graphic, fantasy-style representation of the Rainbow Serpent in the act of creating the Nyoongar people. Swathed in atmospheric layers of paint, it was a lurid visualization of an epic story, and showed Pickett assertively extending himself beyond the picturesque boundaries of the Carrolup style. Pickett’s confidence in his Nyoongar cultural identity was matched with an increasing visibility in the local community. Pickett moved in a circle of supportive and ambitious young Nyoongar men, which included playwright Richard Walley, actor Ernie Dingo and artist Lance Chadd, all of whom cite him as a source of wisdom, counsel and inspiration. In 1981 Pickett produced the sets for Jack Davis’ play Kullark – The Dreamers, and he volunteered his time to many Indigenous groups including the Aboriginal Planning Group, the WA Aboriginal Artists Advisory Council and the Australia Council’s Visual Arts and Craft Committee for Aboriginal and Torres Strait Islander Arts. It was around this stage that Pickett’s career began to flourish. In 1986 he was awarded the Museum and Art Galleries Award at the Third National Aboriginal Art Awards (for the work Three Faces of the Sun reproduced above) and in 1988 he was declared Western Australian Aboriginal Artist of the Year. While his landscape and magic realist tableaus brought him great respect and admiration in Western Australia, it was his move to abstraction in the late 1990s that saw Pickett‘s recognition as an artist of truly national standing. This coincided with a long association with gallerist Diane Mossenson of Indigenart, Mossenson Galleries. At Mossenson Galleries, Pickett found the stability and encouragement to experiment, developing a unique personal style of gestural abstraction. His decade-long association with Indigenart was the most productive and successful era of his career, and saw him included in numerous important exhibitions including South West Central (Art Gallery of Western Australia, 2003) and Culture Warriors: The National Indigenous Art Triennial (National Gallery of Australia, 2007). In 2006 he was granted a retrospective at the Perth Institute for Contemporary Arts. In the same year he won the Sunshine Coast Art Award and the Joondalup Invitation Art Award, and in 2007 he was awarded the $40,000 first prize in the inaugural Drawing Together Art Award. Pickett’s move to abstraction was driven by a desire to find deeper, more intuitive spiritual meanings in the landscape. According to Nick Tapper, “Pickett came to feel that representation of the skin and hair of the environment – its landforms, flora and fauna – missed the resonant undercurrents flowing amongst these elements.” As he matured, and his cultural knowledge increased, Pickett increasingly felt that traditional representations were incapable of expressing his deeper understanding of the landscape. Shane Pickett, Wanyarang the Calling Season for Rain, 2006, Caloundra Regional Art Gallery. With this knowledge, he realised, came a greater responsibility. This was something that Pickett felt strongly about – both in respecting his elders and passing his knowledge to a younger generation of Nyoongar people. Shortly before his death, he confided that his proudest achievement was his participation in the monumental Ngallak Koort Boodja (Our Heartland) canvas produced on behalf of the Nyoongar elders for the 2006 Perth International Arts Festival. Pickett took great pride and pleasure in the extensive consultation with both the community and elders of the Nyoongar nations that occurred before commencing work on the monumental piece. He saw the project as being an important galvanising moment in the Nyoongar community, and felt that it was imperative that it correctly reflected the teachings and values of his elders. Between 1980 and 1983, Pickett completed a Diploma in Fine Arts at the Claremont School of Fine Arts in Western Australia. Although he valued the technical skills he had learnt there, Pickett often lamented the lack of Indigenous teachers. He sought to redress this imbalance, offering his services in numerous community workshops, primary and secondary colleges, along with teaching Aboriginal prisoners at Canningvale Prison. An important role model in his community, he dedicated considerable time to assisting with troubled or disaffected youth, guiding them quietly and calmly with his gently spoken cultural teachings. Pickett was also influential for young Nyoongar painters. Between 1996 and 2003, he worked as a lecturer at TAFE in Midland and Bunbury, helping to develop the Diploma of Aboriginal Visual Arts course. Pickett’s influence and stewardship led to the widespread adoption of his style amongst a younger generation of artists. The success of his abstractions inaugurated a new school of Nyoongar painting whose influence can be seen in the work of many young artists, including Ben Pushman and Troy Bennell. At its heart, Pickett’s move to abstraction had a cross-cultural mission. From his earliest works, he saw himself as an ambassador for Nyoongar culture. Although a softly spoken, quiet advocate, Pickett was unwavering in his championing of Nyoongar cultural values. Generous with both his time and knowledge, he was a popular speaker, always willing to patiently explain the complex philosophical minutiae of Nyoongar teachings. Shane Pickett, Wanyarang Lightning Calling 2005. Pickett’s abstract paintings communicate these teachings intuitively to an uninitiated audience. According to Pickett, “A lot of them don’t know what they are seeing, but often they’ll have an idea. When they do know what the story is about, they get drawn in.” For Pickett, abstraction was a method for leading people to their own personal communication with the Dreaming, and through this, to a respect and understanding of Indigenous values. Perhaps this explains the popular appeal of Pickett’s work, for like Pickett, they were never judgemental, but softly guided the viewer into a dialogue with the magical world of the Dreaming. In 2007, he noted, “The Dreams do run strongly through the views of my life.” This is perhaps his lasting legacy; in Pickett’s Dreaming we find a dialogue that crosses all cultural barriers, uniting all people within his a powerful cosmology of reconciliation. Shane Pickett died on Friday 15 January 2010 following a sudden bout of illness. He is survived by his wife Violet, his sons Roger and Trevor, and his five grandchildren.